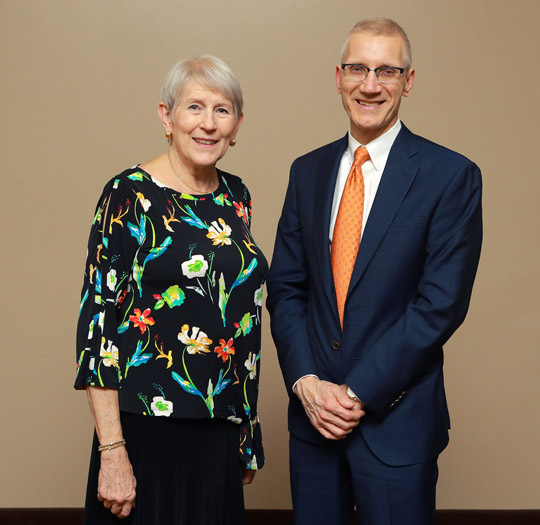 UT outstanding advisors, researchers and teachers, and recipients of the Edith Rathbun Award for Outreach and Engagement, were recognized last week. 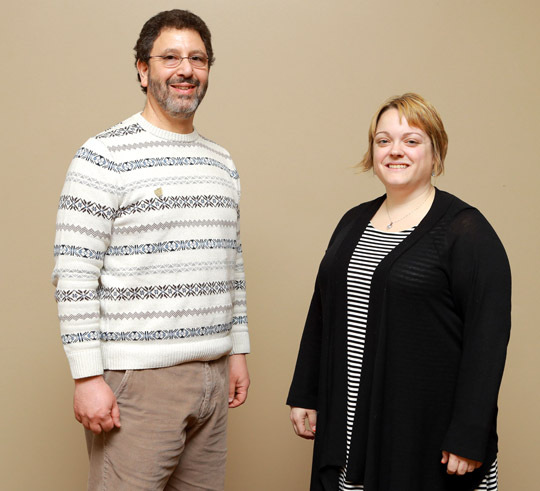 Winners of the Outstanding Adviser Award were Dr. Jerry Van Hoy and Amanda Seabolt. Amanda Seabolt, academic advisor in the College of Natural Sciences and Mathematics. The UT alumna received a bachelor of science degree in biology, a master of public health degree, a master of science degree in nursing, and a graduate certificate in gerontological practice. She will graduate with a doctor of philosophy in curriculum and instruction from the University next month. Seabolt started advising students in 2015, the same year she received one of UT’s Outstanding Staff Awards. Dr. Jerry Van Hoy, associate professor of sociology in the College of Arts and Letters. He is co-director of the Program in Law and Social Thought and director of the Master of Liberal Studies Program. Van Hoy joined the University in 2000 and received one of UT’s Outstanding Teacher Awards in 2013. 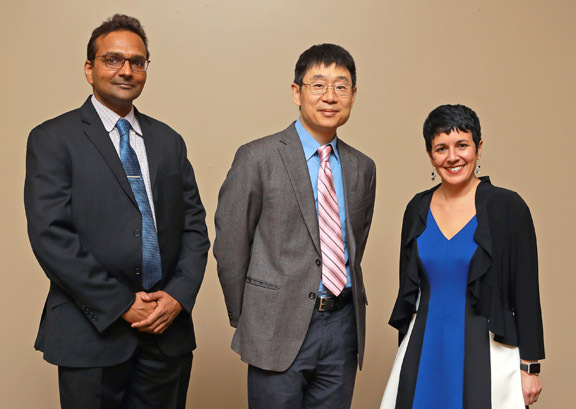 Receiving Outstanding Research and Scholarship Awards were, from left, Dr. Vijay Devabhaktuni, Dr. Yanfa Yan and Nicole Buonocore Porter. Dr. Vijay Devabhaktuni, professor of electrical engineering and computer science in the College of Engineering. He is executive director of emerging technologies and special advisor to the UT vice president, chief information officer and chief technology officer. Devabhaktuni joined the faculty as an associate professor in 2008. He is a renowned expert in computer-aided design, machine learning, modeling, optimization and simulation as applied to electromagnetics, big data, biomedical engineering, cyber security, energy efficiency, virtual reality, wireless sensor networking, image and signal processing, and more. Since 2009, the National Science Foundation has supported his work. While at UT, he has received about $2 million in funding from more than 30 external grants and has published more than 80 papers. According to Google Scholar, Devebhaktuni’s work has been cited 3,200 times since 2013. Nicole Buonocore Porter, professor of law in the College of Law. She joined the faculty as an assistant professor in 2007. Porter is a nationally recognized scholar on the employment rights of women and individuals with disabilities. She is the author of a disability law casebook, published by a leading legal academic publisher, and is the co-editor of a forthcoming book titled “Feminist Judgments: Employment Discrimination Opinions Rewritten.” Her published articles address the persistent pay gap between men and women, discrimination against workers with caregiving responsibilities, and the employment rights of individuals with disabilities. Her work has been cited more than any other faculty member in the UT College of Law, and she is frequently invited to speak at symposia and national conferences. In addition, Porter was invited to join the Labor Law Group, a prestigious organization that produces scholarship on labor and employment law. Dr. Yanfa Yan, professor of physics in the College of Natural Sciences and Mathematics. He joined the UT faculty in 2011. For two decades, Yan has been researching photovoltaics, solar fuels and energy storage techniques using a combination of theory, material synthesis, device fabrication, and material and device characterization. He has written or co-written more than 350 articles and has given more than 50 invited talks. According to Google Scholar, Yan’s work has been cited 16,868 times. His work has been funded with more than $5 million from the National Science Foundation, Department of Energy, Office of Naval Research and private industry. Recipients of the Edith Rathbun Award for Outreach and Engagement were Dr. Susan Batten and Kenneth Kilbert. Dr. Susan Batten, professor in the College of Nursing. She joined the University in 1995. Batten coordinates patient intake for the UT Community Care Clinic at Cedar Creek Church, provides care during Labre Traveling Clinic in south and east Toledo, and for migrant workers at their resident camps in northwest Ohio. She also has mentored nursing, medical and pharmacy students during annual medical missions to Guatemala, Honduras and Haiti. Batten has worked with more than 1,000 UT students with her community outreach and service projects. Their work has impacted more than 4,000 chronic disease patients in northwest Ohio, 500 immigrant workers and their families in rural Ohio, and more than 40,000 patients in Honduras, Guatemala and Haiti. Kenneth Kilbert, professor and director of the Legal Institute of the Great Lakes in the College of Law. He joined the University in 2006. A scholar of environmental law, Kilbert’s work focuses on water issues affecting the Great Lakes region. Since 2006, he has planned UT’s annual Great Lakes Water Conference, which addresses legal and policy issues important to the region and its water resources. Each year, the conference draws approximately 300 guests and garners extensive media coverage. In addition, Kilbert has received multiple grants to study harmful algal blooms in Lake Erie. His scholarly work increases awareness, promotes best practices, and suggests legal solutions to address the algal bloom problem. Kara Bruce, professor in the College of Law. She joined the faculty in 2010. Dr. Edward Cancio, associate professor of special education in the Judith Herb College of Education. He came to UT in 2007. Elyce Ervin, senior lecturer in the School of Exercise and Rehabilitation Sciences in the College of Health and Human Services. She has been teaching at the University since 1999. Dr. Jackie Layng, professor of communication in the College of Arts and Letters. She has taught at the University since 1997. Dr. Kim E. Nielsen, professor of history, disability studies, and women’s and gender studies in the College of Arts and Letters. She joined the faculty in 2012. John J. Schlageter III, senior lecturer in the Paralegal Studies Program housed in the School of Social Justice in the College of Health and Human Services. He is a graduate of the UT College of Law and has been teaching at the University since 1998. Taking home Outstanding Teacher Awards were, from left, Elyce Ervin, Dr. Jackie Layng, John J. Schlageter III, Dr. Kim E. Nielsen, Kara Bruce and Dr. Edward Cancio. • Joseph Slater of the College of Law. • Sara Yaklin of the Department of English in the College of Arts and Letters. This entry was posted on Wednesday, April 25th, 2018 at 3:42 am and is filed under Alumni, Arts and Letters, Business and Innovation, Engineering, Law, Natural Sciences and Mathematics, News, Nursing, Research, UToday, — Judith Herb College of Education .